The purpose of this overall guide is to provide visual help for general measuring guidelines at a glance. For specific step by step measuring directions, please refer to our full guides below. From top of left shoulder tip across back all the way to top of right shoulder tip, seam to seam. Circumference measured around the chest at the fullest part, placing the tip close up under the armpits. Making sure you are not wearing a belt, put a tape through your pant loops, inhale deeply and measure your girth. 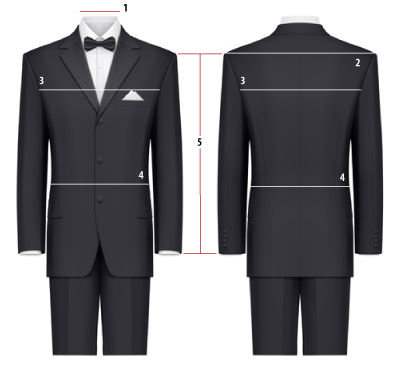 Measure from the centre of your collar to the tip of your shoulder and to the end of your sleeve.